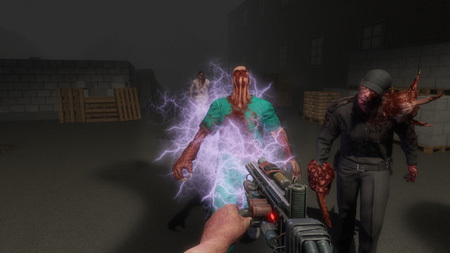 Mutation Phase is a horror-shooter game from IGRODELSKY, with a first-person view, which narrates the consequences of experiments with sound waves. You have to survive among hordes of mutants and get out of the danger zone. The situation got out of control. All the personnel of the research complex, as well as local residents, were subject to a strong change in the structure of DNA, as a consequence of which aggressive mutants filled the territory within a few kilometers. In the role of one of the engineers of the complex, who managed to keep his sanity and temporarily restrain the transformation of his body, you have to cope with the disease and get out of the danger zone. First you will play in the story mode, where you will discover the plot and master the basic game mechanics. After that you will unlock the survival mode, in which you have to fight off constantly arriving hordes of mutants in various locations. If you get stuck in the game, check out the video walkthrough and gameplay for the game. This entry was posted in PC Games, Walkthrough and tagged Mutation Phase Cheats, Mutation Phase Game, Mutation Phase Gameplay, Mutation Phase Guide, Mutation Phase Hints, Mutation Phase Review, Mutation Phase Solutions, Mutation Phase Strategy, Mutation Phase Tips, Mutation Phase Walkthrough by Marvin. Bookmark the permalink.